While the cost of graffiti vandalism in the U.S. has not been definitively documented, many municipal governments, communities and property owners report that the cost is rising each year. Based on figures from a variety of cities across the country, graffiti cleanup costs tax payers $1-3 per person. In smaller communities, the cost is less than $1 per person. Immediate removal of graffiti—within 24 to 48 hours—is the key to successful prevention. There are four types of graffiti: tagging, satanic/hate, gang and generic. Generic graffiti consists of non-threatening messages like “Bobby loves Suzy” or “Class of 2000.” Houston mainly deals with gang and tagging graffiti. Tagging graffiti is more ornate, while gang graffiti uses symbols. It is a common misperception that most graffiti is done by gangs, when, in fact, gangs are responsible for less than 10% of graffiti. Graffiti vandals represent every social, ethnic and economic background. Suburban males, pre-teen to early 20s, commit approximately 50% of graffiti vandalism. The average age of those arrested for graffiti vandalism is 17-18, with an overall broad range of 8-54. Community paintbrush murals are rarely defaced by graffiti and instill a sense of pride among those who live nearby. There are four primary motivating factors for graffiti vandalism: fame, rebellion, self-expression and power. Getting the media to publish photos and video of graffiti is often considered the mark of ultimate fame for graffiti vandals. You’ve probably seen graffiti somewhere in your community. It’s the words, colors and shapes drawn or scratched on buildings, overpasses, train cars, desks and other surfaces. It’s done without permission and it’s against the law. The term “graffiti” comes from the Greek word “graphein,” which means “to write.” Today, graffiti ranges from simple one-color monikers (like a nickname) repeated on many surfaces to complex compositions of several colors. How is Houston harmed by graffiti? First, graffiti vandalism is a drain on your tax dollars. Second, graffiti diminishes residents’ sense of safety and security in a community. Neighborhoods with illegal graffiti see a decrease in property value and a loss of business growth and tourism. Finally, the presence of illegal graffiti sends a signal that nobody cares, which can result in other forms of crime and street delinquency in the neighborhood. Is all graffiti the same? No. There are different types of graffiti. The most common in Houston are gang graffiti and tagger graffiti. According to the National Council to Prevent Delinquency, about 80% of graffiti is hip hop or “tagger” graffiti. Another 5% are “pieces.” Nationally, gang graffiti makes up about 10%. Gang graffiti is communication used to promote the gang, mark territory, name rivals and alliances, and announce the gang’s presence in a community. It can also be used to threaten violence. Gang graffiti is usually not stylized. It depicts gang names, symbols, and identifiers. The gang’s name is usually prominent and the gang member’s name, if included, is less of a feature. Gang graffiti is usually limited to the community that the gang is from. Tagger graffiti promotes individual vandals or tagging crews, which are groups of individuals who work together to put up graffiti. They deface property for recognition, notoriety or thrill. Tagger graffiti depicts a vandal’s moniker, initials, or that of the tagging crew. It may also consist of drawings or images. The vandal’s moniker is usually more prominent and the tagging crew’s name, if there is one, will usually be less of a feature. Tagger graffiti is more graphic. It’s usually larger than gang graffiti with more color and design. Tagger graffiti tends to be more prolific. It’s found in more areas and on more surfaces in order to be seen by more people. Hate or ideological graffiti consists of any racial, religious or cultural slur. What happens to a graffiti vandal who is caught? Is it really illegal? Laws, codes and ordinances that deal with graffiti vandalism may vary from community to community, but graffiti is illegal. Typically, graffiti falls under “institutional vandalism” or “criminal mischief.” While a graffiti offense may be considered a misdemeanor, which is a minor offense, more than one such offense can add up to a felony. What is the penalty for tagging in the City of Houston? In the City of Houston, the penalty for tagging can be a misdemeanor if damage is less than $500. The offense can also be a felony if damages are more than $500. The degree of the felony depends on the amount of damage done. A misdemeanor includes a fine, time in jail or both. A City ordinance prohibits any citizen under the age of 17 from purchasing “implements of graffiti,” including spray paint and big-tipped markers. Houston treats graffiti as a crime, not a prank. How do you remove graffiti? There are several ways to remove graffiti. The most widely used method is the paint-out, which is to simply paint over the graffiti. Other methods involve the use of solvents, chemicals and water and sand blasting. What is the best way to prevent graffiti? There are two good ways to prevent graffiti. The first is to remove it promptly. While this may be difficult, studies show that removal within 24 to 48 hours results in a nearly zero rate of reoccurrence. The second is to turn a graffiti-targeted wall into a mural. Paintbrush murals are almost never hit with graffiti and are a great way to get a community involved in graffiti prevention. 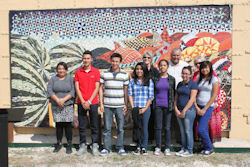 Murals can involve local artists, youth and community volunteers. Your local paint store may be willing to donate paint and brushes. The City’s Environmental Services Center, at 11500 South Post Oak, provides repurposed paint free of charge to citizens for the removal of graffiti, Fridays, 9 a.m. – 12 noon. In cases requiring an immediate deadline for the removal of graffiti, residents can call 713-551-7355 for an appointment. What are some community activities that can help prevent graffiti? There are lots of things that you can do. Organize a paint-out or paintbrush mural to cover a wall plagued with graffiti. Adopt a wall at your school or in your neighborhood and make sure it stays free of graffiti. Carry out school and neighborhood activities to educate citizens about graffiti and its negative effects. Of foremost importance, always report graffiti to the proper authorities.